(12 mins read) We check in to Banksy’s bizarre Palestinian hotel, where the hospitality is as peculiar as the message is powerful. Salsa notes that The Walled Off Hotel has not only attracted a new kind of visitor to Bethlehem but has also persuaded many to spend time in other parts of the occupied West Bank, too. Hotels may be used to customers taking shampoos and soaps, even the odd towel, as mementoes of their stay. But at the Walled Off, the stakes are a little higher. Guests are issued with an inventory they must sign on departing, declaring that they have not pilfered any art from their room. But it is the wall itself that is the dominant presence, towering over guests as they come and go, trapping them in a narrow space between the hotel entrance and an expanse of solid grey. The crowbar-armed cherubs he brought to London were painted in time for Christmas last year when he recruited film director Danny Boyle – of Slumdog Millionaire fame – to stage an alternative nativity play for local families in the hotel car park. The “Alternativity”, featuring a real donkey and real snow produced by a machine on the Walled Off’s roof, became a BBC documentary. 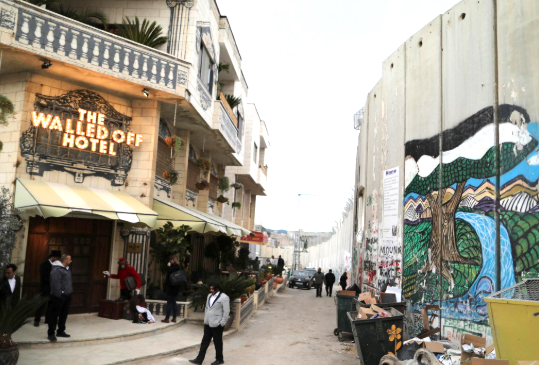 Banksy had once again found a way to persuade prime-time TV to shine a light on Israel’s oppressive wall.